As you may have noticed, I’ve been taking a bit of a sabbatical from my blogging lately. Between a full time job and full time commitment to family, it can be a challenge to fit everything else in. So, after four and a half years of regular weekly blogging, I gave myself permission to skip blogging for a while, and rethink the goals and focus of my blog. As it turns out, I’m enjoying the freedom from my self-imposed deadlines. Who knew? So for now, I’m taking a step back from blogging. I may pop in occasionally to say hi and share my literary thoughts, but it will probably be some time before I start blogging regularly again. In the meantime, thanks for hanging out and reading with me the last few years. Please feel free to keep in touch through email or Facebook. And I look forward to blogging again, when the time is right. Length: 10 hours, 37 minutes. Unabridged. Catherine West’s latest book is aptly titled. Savannah’s life has taken a drastic turn off course, and she’s not sure what, if anything she can do about it. But over the course of the story, she finds her hope, and her emotional journey makes for a great read. This is excellent women’s fiction featuring complex characters and relationships. The story doesn’t shy away from grittier topics like marital problems, but it keeps a Christian worldview throughout, and will appeal to fans of edgier Christian fiction. It’s an emotionally powerful read, and well worth reading. My one disappointment in an otherwise excellent story, was with one minor character who I thought was more stereotypical caricature than character. Savannah’s sister-in-law Janice plays a key role at one particular point in the story, but I felt like she was created with that one role in mind, as a sort of judgmental straw-man to be knocked down. I would’ve liked to see her drawn with a little more depth, because she felt really out of place in a story with otherwise great characterization. Overall, the story is beautifully written, and takes the reader to some really challenging and thought provoking places. It would make for a fabulous book discussion group selection. Narrator Suzie Althens does a wonderful job bringing Savannah and her family and friends to life in this story. Her voice is pleasant, with just the right degree of emotion incorporated to heighten the drama. I would highly recommend the audio edition of this story. I borrowed this audiobook from my local library via Hoopla. I was not expected to write a review, but wanted to share how much I enjoyed the book. Length: 8 hours, 53 minutes. Unabridged. The Heart Between Us has so much going on between its pages that it’s hard to know where to begin. There’s an exploration of family and sisterhood, and of forgiveness. There are fears holding characters back from truly living, and an epic journey (both physical and emotional) for them each to understand their own fears and what to do about them. A look at what it means to be strong, and where true strength comes from. There’s a bucket list and international travel galore – enough to prompt wanderlust in the most homebody-ish of readers. There’s sweet romance included, that’s great fun to read, but on a scale that doesn’t take over the story, which focuses more on the individual characters’ journeys. I’m glad I read this book. I found myself relating to Crystal and Megan on a pretty deep level, and found that the book’s themes – faith, family, and trusting God with your fears – hit home for me. This is one of those books that prompts thought and reflection, and could make a great selection for a book discussion group. Emily Sutton-Smith’s reading brings out the sisters’ distinct personalities and quirks through subtle differences in their speaking style. She also does good work with the accents of some secondary characters. The pacing and enunciation is clear and unobtrusive, making this a fun and easy listening experience. Highly recommended. Welcome to the July 2018 edition of the Christian Fiction Book Club Connection. Thanks for stopping by! Whether you’re a pastor or ministry leader thinking of forming a book discussion group at your church, a current member of a book club, or simply a fan of Christian fiction hoping to connect with other readers, you’re in the right place. Please consider subscribing to my blog so you won’t miss future posts. Today I’m providing information on Christian fiction discussions scheduled to take place around the web this month. I’m also featuring a handful of recently released Christian fiction titles for which a discussion guide is available, either included in the book itself or on the author’s or publisher’s web site. The ACFW Book Club‘s July selection is With Love, Wherever You Are by Dandi Daley MacKall. You can subscribe to the group’s e-mail list now, by following the instructions on their Web site, to be sure not to miss any announcements or discussion questions. By the Book is an in-person book discussion club that has introduced an online Facebook-based discussion option. To join in online, like the By the Book Facebook page, and be sure to check back there periodically for any discussion that may not have made it into your news feed. July’s selection is The Hideaway by Lauren K Denton. For July, the Christian Fiction Devourers group on Goodreads is discussing Pearl in the Sand by Tessa Afshar AND The Innkeeper’s Daughter by Michelle Griep. Grab your copies and head on over to the discussion forum to check in with others who are in the midst of reading these books. The Fans of Amish Fiction Goodreads group discusses one Amish fiction title per month. The selection for July is Joshua’s Mission by Vannetta Chapman. To join in, visit the group’s online discussion board. So, friends, what have you been reading lately? Any titles you’d recommend for book club discussions? Length: 9 hours, 56 minutes. Unabridged. This book was yummy. I didn’t literally eat the book, of course. But I would’ve gladly joined the supper club for a fabulous meal, if I could’ve wrangled one of those coveted invites! Rachel and Alex’s story is a sweet and spicy contemporary Christian romance with substance, and a very enjoyable read. The story’s set up and the thematic look at how social media can inadvertently impact someone’s life drew me in, and the growing relationship between the story’s leads kept me intrigued, right up to the satisfying, if not entirely unexpected ending. Both Rachel and Alex have interesting backgrounds, and their character development over the course of the story is realistically portrayed. I think I can guess who might be featured in future installments of this series, and I hope I’m right. I’m definitely looking forward to more from the supper club. The narrator, Teri Shnaubelt, presents both male and female voices well, though I have to say I liked the heroine’s voice better than the voices of her girlfriends, which tended a bit more toward wheedling at times than I would have preferred. That said, pacing and enunciation were great, and emotion was well portrayed throughout the story. I will be seeking out the audio edition again, when future books in the series release. 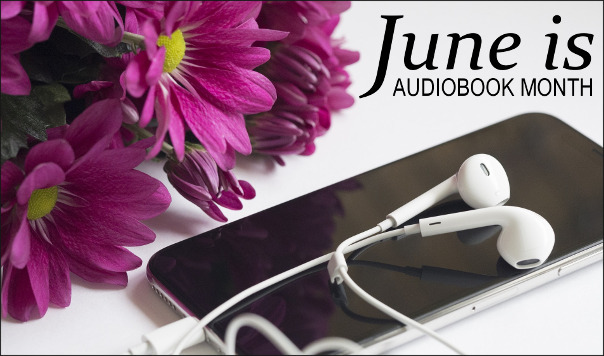 Because I #LoveAudiobooks, I’ll be celebrating “June is Audiobook Month” pretty much all month long on my blog, starting with today’s post. For today, I’m featuring some favorite recent listens, what I’m reading now, and a few of the titles on my to-be-read list. I’ll also refer you on to more “June is Audiobook Month” themed festivities you may want to check out elsewhere on the web. With a 45 minute commute each way to and from work, and with plenty of other opportunities for listening (while doing laundry or dishes, while working out, etc.) when traditional reading just isn’t practical, I find I tend to read more audiobooks than print books lately. And I love every minute of it. I’m always on the lookout for more great reads to add to my to-be-read list, so please share in the comments if you’ve been listening to any great books lately! The Audio Publishers Association blog tour will be featuring audiobook themed posts and giveaways all month long. There will also be free weekly giveaways at Audiobook.com throughout the month of June, including Once Upon a Prince by Rachel Hauck (June 8th… It’s one of my favorite audiobooks). Thanks so much for stopping by to celebrate audiobook month with me! I hope to see you again next week for more audiobook themed fun. 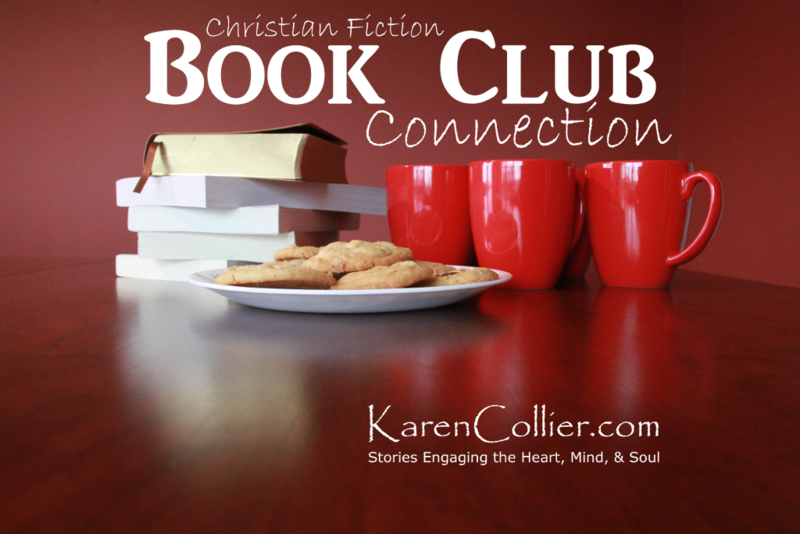 Welcome to the June 2018 edition of the Christian Fiction Book Club Connection. Thanks for stopping by! Whether you’re a pastor or ministry leader thinking of forming a book discussion group at your church, a current member of a book club, or simply a fan of Christian fiction hoping to connect with other readers, you’re in the right place. Please consider subscribing to my blog so you won’t miss future posts. The ACFW Book Club‘s June selection is Callum’s Compass by Sara L Foust. You can subscribe to the group’s e-mail list now, by following the instructions on their Web site, to be sure not to miss any announcements or discussion questions. By the Book is an in-person book discussion club that has introduced an online Facebook-based discussion option. To join in online, like the By the Book Facebook page, and be sure to check back there periodically for any discussion that may not have made it into your news feed. June’s selection is The Sea Before Us by Sarah Sundin. For June, the Christian Fiction Devourers group on Goodreads is discussing No Other Will Do by Karen Witemeyer AND A Worthy Pursuit by Karen Witemeyer. Grab your copies and head on over to the discussion forum to check in with others who are in the midst of reading these books. The Fans of Amish Fiction Goodreads group discusses one Amish fiction title per month. The selection for June is The Cherished Quilt by Amy Clipston. To join in, visit the group’s online discussion board. Length: 15 hours, 17 minutes. Unabridged. She’s Out to Steal His Name. Will He Steal Her Heart Instead? Rosemary Gresham has no family beyond the band of former urchins who helped her survive as a girl in the mean streets of London. Grown now, they are no longer pickpockets–instead they focus on high value items and have learned how to blend into upper-class society. Rosemary is beginning to question whether she can continue in this life when she’s offered the challenge of a lifetime–determine whether a certain wealthy gentleman is loyal to Britain or to Germany. After all how does one steal a family’s history, their very name? As Europe moves ever closer to World War I, rumors swirl around Peter Holstein. Awkward and solitary, but with access to the king, many fear his influence. But Peter can’t help his German last name and wants to prove his loyalty to the Crown–so he can go back to anonymously writing a series of popular adventure novels. When Rosemary arrives on his doorstep pretending to be a well-credentialed historian, Peter believes she’s the right person to help him dig through his family’s past. When danger and suspicion continue to mount, both realize they’re in a race against time to discover the truth–about Peter’s past and about the undeniable attraction kindling between them. A Name Unknown is a delightfully fun read for those readers who like their historical romance with a touch of mystery, intrigue, and humor. The characters are particularly fabulous. Rosemary for her compelling character arc and faith journey. Peter for his charming awkwardness combined with his thoughtfulness toward others, and an appealing quality I can’t quite pin down with words. I admired the way he “talked” so easily about his faith (in written form anyway), and I enjoyed watching the progression in Rosemary’s beliefs as they wrote back and forth. Their romance is sweet and includes some of my favorite tropes and character traits. There’s a plot twist I didn’t see coming that was… intriguing. I’m tempted to re-read the whole thing just to convince my inner skeptic that all the pieces really do fit the twist. LOL! But I won’t give away any details. You’ll want to read this for yourself. I listened to the audio edition and absolutely loved it. Peter’s stuttering plays quite well in spoken form, and halfway through I had to track down a print copy to see if the author wrote it all out that way or if the narrator was ad-libbing. Sure enough, it’s there in written format too. I think it speaks to both the author’s and the narrator’s skill that Peter’s speech impediment comes across believably and sympathetically in the story, without becoming a barrier to the reader’s enjoyment. Narrator Liz Pearce expertly employs a wide range of voices in terms of accent, gender, age, and emotion, resulting in a lovely overall listening experience. Thank you to Recorded Books for providing a complimentary copy of the audiobook for review purposes.